For people working in a community that changes as regularly as AML and financial crimes prevention, it can be challenging to find the time to reflect on bigger-picture trends. As criminals find increasingly more inventive ways to launder money and commit other financial misdeeds, compliance officers are required to adapt quickly to find new ways of detecting and preventing these crimes. That doesn’t leave a lot of time for deep thought on the state of the industry as a whole. However, this kind of reflection is crucial to help our community move forward. To know where we’re going and how to meet the challenges coming our way, we need to have a good idea of where things stand currently, and how far they’ve come. We’ve curated a resource to give time-strapped compliance officers some context and a snapshot of the state of the industry as it is in 2019. 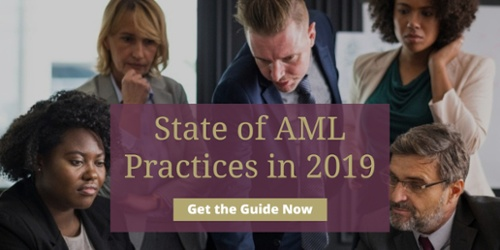 Our new eBook, The State of AML Practices in 2019, is made up of a collection of articles written by AML RightSource Vice Chairman John Byrne for his blog on the ACAMS website and the AML RightSource website. In his blog, John brings insights and expertise, developed in over 30 years of experience as a regulatory and legislative attorney specializing in banking and financial crimes. Over that time, he’s seen how much has changed in the AML community’s efforts in preventing financial crime and has developed a keen sense for what challenges the industry will face in the future. The eBook includes thought leadership and information about the biggest challenges compliance officers will face over the next few years, common misconceptions about financial crime prevention, the benefits, and drawbacks of proposed legislative solutions, and what the community as a whole needs to do in order to continue its progress. Get your free copy of this great resource here.